On November First, we, with all the Church, celebrate the feast of All Saints. This is a glorious occasion and you can almost hear Heaven erupting in songs of praise to God for so many examples of successful lives on earth. It is delightful to remember that this is not the feast of just the BIG saints like St. Peter, St. Dominic, St. Catherine of Siena, and so many others who are on the list of canonized members of our human race. 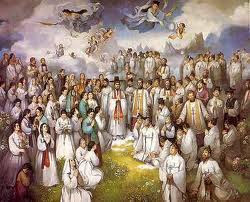 Each of these holy people have their own feast day when we celebrate their life in the Lord. However on this day it is a joy to celebrate the ‘little’ people who do not have a special day called their own feast. There are so many of these who have now taken their place inside the Golden Gates of Heaven. I can think of the single parent who raised the children in faithfulness and love without thought about their own hardships and suffering. There is the old uncle who took his Catholic wife to Church every Sunday but could not bring himself to be baptized - until he was in his last illness and asked for the Sacrament, going off to heaven in his baptismal purity. Then there are so many little children who die in the state of innocence before they have learned to sin. We all know many of these people as our teachers, mentors, neighbors, relatives, friends. On this day, so joyful in heaven and on earth, think back to those whom you knew and admired. They are still aware of you and are praying for you. Talk to them and share your hopes and fears, sadness and joy, plans and projects. They will be happy to help you. And thank our loving God who placed each one in our path of life.